This app provides a Chinese learning platform to the 4-years-old non-Chinese babies. More than 200 retina level pictures included in the app, including animals, birds, fishes and even paper-cut paintings. Baby can slide the pictures and learn, doing interactive test, then review the words in the stickers wall. 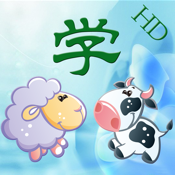 The pictures and words used in the app have the mild characteristics of Chinese culture. Through study, baby also can learn the looking of some typical Chinese things like food, toy etc. Enjoy your happy time; search us with “tiqiaa” or “tianjia” in app store.